If you’re looking for 3-day cruises from New Orleans look no further than the Norwegian Cruise Lines mini weekend vacation at sea, aboard the newly refurbished Norwegian Dawn. While a Carnival cruise from New Orleans can take you on 4, 5, 6 or 7 day trip and Royal Caribbean can offer 7 or 15 nights at sea, it is Norwegian that has perfected the 3-day jaunt from this southern Louisiana port. Your weekend begins as you get your first glimpse of the Dawn. She was the first of Norwegian’s fleet to feature the colorful artwork on her flanks, and since her refurbishment she has become better than ever, with 50 added cabins, 14 places to dine and more entertainment packed into her 965 feet. 3-day cruises from New Orleans aboard the Dawn take you for a leisurely jaunt around the Gulf of Mexico, and while it is true those other lines can take you on cheap cruises to Mexico, this cruise is more about the ship and getting away from the everyday than it is about ports of call. Considered one of the cheap cruises from New Orleans, this cruise starts at only $249 per person and allows you to explore the ship for three days where you can check out Second City Comedy shows, live stage shows, the soaring 8 story atrium and attend wine tastings. If this weekend includes the kids, they’ll love the T-Rex kid’s pool, the teen club and the video arcade, while you enjoy the spa. Although 3 day cruises from New Orleans are perfect for that romantic getaway but also serves as great get-togethers that the entire family can enjoy. Norwegian’s freestyle approach to cruising is ever more evident with the advent of the ‘largest suite at sea’; the Dawn has two such suites that include three bedrooms, a private garden and 5,750 sq. ft. of luxurious space which is always at a premium on a ship. 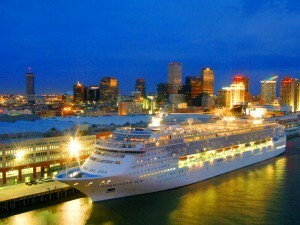 The Dawn sails from the modern New Orleans cruise port, which is located at the heart of downtown, close to all the major attractions and almost a destination in itself. Check out the sights and sounds of the French Quarter; see one of the largest aquariums in the world, shop till you drop at the mall that is merely feet from the dock, all of this before you even climb aboard the Norwegian Dawn for your weekend at sea. If you are looking for a destination cruise, then this 3-day cruise from New Orleans will likely be overlooked, but there is something to be said for a calm and relaxing loop around the warm Gulf of Mexico, something that fits into the whole Norwegian cruise attitude like a charm.